Celebrities hunt for antiques across the UK. Ronni Ancona and Jan Ravens head for auction in Stockport, joined by experts Phil Serrell and James Braxton. Browse content similar to Ronni Ancona and Jan Ravens. Check below for episodes and series from the same categories and more! Oh, we've had some fun, haven't we? There will be worthy winners. On today's show, prepare yourself. We have a pair of funny girls from the dizzy heights of British comedy. Jan Ravens and Ronni Ancona. We need a couple of bottles of Bolly, don't we? Do you know, we could. We could just go away, darling. Just get a couple of bottles of Bolly, darling. Shall we just get a couple of bottles of Bolly? And go on the run. But not before you buy some antiques, you two! the smouldering Ronni has an illustrious career spanning over 20 years. her Victoria Beckham impersonation become a much-loved hit. with sterling performances as Peggy in EastEnders and cooking goddess Nigella. the popular Dead Ringers series. and even Her Majesty The Queen in her vast collection of extraordinary impersonations. and have a rather nifty 1977 Jaguar XJC to whoosh about the country in. I do like a walnut fascia. They each have a bag of money totalling £400. I'm going to spend all the money on a handbag for me. You've got to sell the thing you've bought. -You've got to make a profit. Can I just check the contract on that? Ooh, I think we need a bit of expert guidance. And who better than auctioneers James Braxton and Philip Serrell? Well, for me, this is a lifelong ambition that I've now achieved. -What, to be driven in a Bentley? Braxton? Drive on, Braxton. Get the Bentley, Braxton. -It's got a nice ring to it. -It's got a good ring, hasn't it? -I like it a lot. to purr about the place in. James, when was the last time we worked together? Must have been last year. and then you start teasing them, obviously. -Yeah, I know where this is going. for about 18 years, 16 years? James, I don't wear a wig. Just concentrate on the driving, Braxton! Who are you hoping to have, by the way, as your expert? I just hope it's not that grumpy one that wears a scarf. before landing in the Cheshire town of Stockport for the auction finale. Time to meet the grumpy one with the scarf, and good old Brackers. -It's a lovely car, isn't it? Could we get some oil, please? -Hello. This is very jolly. It's sunny and it's Yorkshire. Hello, I'm Jan. The most important question is, who's with who? Well, I think James and Ronni have bonded! -Is this a height correlation thing? -Ronni, I can offer you the Bentley. -I think that will do, my darling angel! Will that be all right for you?! Time to get those big wheels moving. ..and Jan and Phil in the Jag. Teams decided, are there any plans afoot? I negotiate for you, or we bring a third person along with us. she would conduct a very proper, ha, negotiation. Let's leave them to it, and join the other pair. Jim, this car, she just purrs! an appalling superiority complex ever since I've got in it. driving a rusty old lawn mower. Can we order up a Bentley for Ronni, please? Redcar Antiques is the first port of call for Ronni and James. Just look at that weather. It's calling us, calling us, isn't it? -It's like a treasure trove. It certainly is jam-packed in there. Ronni wastes no time finding something she rather fancies. Lovely watercolour boxes, aren't they? Who's that? £25, so that's mahogany, isn't it? This reminds me of my grandfather, who was an artist. He used to paint me little scenes from the ballet and send me. to do those big heads on little bodies on football cards. And my mother was an artist, and it ran in the family. and these lovely old palettes. Yeah. That's a nice item, that. especially if we can pass it off as Van Gogh's! We can give it a go, James, what do you think? it's no wonder that it's caught Ronni's eye. -Look. This is a mechanical drinks cabinet. But in my case, it would have to be open at all times! -That is a great thing. And do you come across a lot of these? but now has slightly disappeared from the auction rooms. -This is what people had in their offices. To me, it fascinates me because I think, who opened that up? Who had conversations over that? Romantic. It's priced at £250. let's catch up with Jan and Phil. Do you study dialects and things like that? No. Oh, sorry, do you know what I thought you said? -I thought you said, "Do you study Daleks?" Yeah, no, sorry about that. I was about to say, "No, I've never liked Doctor Who!" Our duo have made their way to the town of Yarm in Stockton on Tees. Rudby House Antiques owned by Sandy is their first shop of choice. It has three floors of wares to peruse. Look, my mum used to have all these Doulton ornaments. I never liked them then. -They're an age gone by, aren't they? Leave the Royal Doulton behind then. Oh, look at these little mouse things! -Can I get them out? due to a chance conversation about being as poor as a church mouse. What you really want from a Mouseman is the earlier examples. But I would think these are probably quite late in Mouseman terms. The cheeseboard has a ticket price of £150. Time for a chat with Sandy, I fancy. It's a lovely little thing, but you've had it a while. -We can tell you what we think we can pay for it. Well, I'll try and do my best for you, I really will. -I know you will, you helped me before. I'll try and do my best. Right. Jan and Phil practise their skills of negotiation. Sandy, could you take £50? Yes, I'm back, so don't say anything you don't want me to hear! I was just about to do an impression of you! -She was doing an impression of you, it was really good! -Yes, I was! I was doing an impression. if you think I'm going to give that away for £100! Thank you. Now, what do we think? Oh, look, we've got matching nails. -We haven't got matching hands, though. You did say £90. I can't do it on £90. -But I'll do it for £100. I'm going to go for the Mouseman cheeseboard. Is that a deal? Deal. You're a lovely woman, Jan.
You're a lovely woman, Sandy, thank you very much. Meanwhile back in sunny Redcar, anybody fancy a wind farm? in a roundabout sort of way? What items do you like? I really do, I do like that Edwardian drinks cabinet. You can buy another item, you know, we can always buy two. What is your opinion at all, even? I like the artist's box. the artist, all that sort of thing. Now, James is going to help guide negotiations. is priced at £250, and the artist's box at £25. Stand by for a masterclass. And Ronni, I would shake his hand at £150. I think we could do £150, yes. -Done a deal! We've done a deal. -But... What about the artist's box? -It can be £10 if you like. Shake his hand, Ronni. Shake his hand. -James, give me your hand. -I could get used to this. I think I'm going to kiss it! Hey, don't frighten the bloke! -Thank you so much, James. He might change his mind! That was swift and efficient. And two lovely lots to start you off. Can you do a Ronni? but you know, I think she's got a bit sick of me doing her, darling. -But actually she's an Exocet missile, darling. Jan and Phil have journeyed to the town of Hartlepool in County Durham. She doesn't know it yet, but we've got a real treat in store for her. This quiet little town dates back as far as the seventh century. it was the site of a terrifying and sordid episode. OK. Well, this is all a bit of a mystery. that took place right here in the 19th century. a French ship was seen floundering off the coast of Hartlepool. Throughout this period, there was a real threat of invasion. to find there was one remaining survivor. ..in a little, sort of, sailor costume. Only the fishermen don't realise it's a monkey. -because they've never seen a Frenchman before. The ship's monkey mascot confused the fishermen. They believed their simian hostage was a French spy. hanging it in the town square. cos they'd never seen a French person before? You've spotted the big thing with the legend. It's complete rubbish, it's not true at all. "The Fishermen hung the Monkey O!" some 50 years after the incident is supposed to have occurred. how stupid could people be. or indeed the Dead Ringers. not to realise these things. And isn't that what satirists do? but I think you have to be careful about what symbols you use. They were living in a different world. The 1850s is a very different world. No, there was no political correctness, that's for sure. you're living in very different sort of times. And humour doesn't age well, does it? Are there people around who believe the story themselves? who believe that the story is still true. before Corvan does his song in 1854.
that even the local rugby team are known as the Monkey Hangers. and even have a statue to the monkey's honour. Hartlepool a piece of folklore that refuses to disappear. Let's catch up now with Ronni and James. Let's hear Nigella preparing a chocolate cake. -No, she doesn't do chocolate cake now. Because now she does things like avocado on toast. But she still makes it sound very complex. It's like eating the essence of life itself. And when it's cooked, it's called toast. Hey, this is lovely, isn't it? My name is Lena, queen of the Lilos. Come! I don't know if you're taking this seriously enough. I am taking it seriously. -What are you finding now? Oooh! Cor, that's got a bit of weight to it. -Has it got a bit of weight? -That's got a bit of weight. It's rather gorgeous, isn't it? I like a bit of brass, don't you? -Do you like a bit of brass? I love a bit of brass. Do you clean it, Ronni? I am a prime brass cleaner. -Now look, I love this, because I'm obsessed with elephants. -Now, I quite like this. Do you know anything... What does it say? Hang on. -it's a vase, it's probably Chinese. So not...definitely not Asian dolphin with a long tongue vase. It's quite sparing, isn't it? It's quite sparing. Beautifully made. So, this is all inlaid. It's a brass body, a bit of silver pewter. Ronni, what's the price on it? -Never look at a price tag. We need to get that under £50. I love the way you said that, "Never look at a price tag." to get to grips with a possible deal. -Have you found something you're interested in? We rather like this piece. Where's he gone? Oh, there he is! You can't miss a Braxton. Phil, what sort of age do you think it is? Yeah, late 19th century, with that band there. -I told James about that, he didn't know. Could that be £40, Phil? It does have a good bit of quality. I think we could probably be doing that at about £65. Now, this is where you sound like your plumber, you see. Well, see, I'd love to help you. I'd love to help you out with that. But, thing is... It's more than my life's worth. -I would have said far less than that! -Oh, no! I've done it all wrong! -I can't go back now! 60 is a very good deal. Ronni's haggled a great discount. about my deal-making at the end. Yeah, I thought the deal-making was rubbish, really. -What, shaved off a fiver?! Go on, go on, drive me home. I was trying to be kind! It was like a shaving of Parmesan. You did a brilliant job there, Ronni. Don't listen to the rumbles from James. I think a bit of a rest, don't you? So, nighty night. how are we feeling this morning, girls? I'm going to be hard, I'm going to be ruthless. -Yeah, ruthless. I'm going to show him. In fact, when James offers a price, I'm going to actually undercut him. And I'll go, "My partner, he don't know what he's talking about. "He may be offering 40, but I'm telling you, 20's my final offer. "I'm going to be Wideboy Ancona today." You've gone more like Pat from EastEnders, actually! Ronni's revved up for buying, but what about Happy and Grumpy? is that you say to Jan "be a Brummie,"
-she can be a Brummie. "Be a Scouser," she can be a Scouser. -"Be a Geordie", she can be a Geordie. There's this instant dialect, accent, whatever. I'm in awe of it, really. Ronni's very elegant and she speaks very quietly. into the realm of antiques with plenty of gusto. Ronni and James launched into proceedings with the utmost of zest. and the Chinese bronze vase. They have £180 left in their road-tripping wallet. Jan and Phil were very careful with their money. and have a massive £300 to splurge. CAR HORN HOOTS Right, let's catch up with the troops. It's got a horn hasn't it? Come on, it's time for more shopping. -What have we got, what have you got? Have you been doing impersonations of us? We want to know that. No, we would never do anything that disrespectful, would we Jan? No. Course we wouldn't. No, we wouldn't. We'd better get on, cos otherwise we'll never get finished today. Whoever you are then, the shops await. Let's jump in with Jan and Philip. no-one listening and we're just on our own, do me a James. the whole time, doesn't he? Sort of from up here somewhere. Hagas Antiques is where we're headed. It's crammed to the rafters, don't you know. Phil is sharing his knowledge. and I'd start again, but I'd make them all odd. a porcelain handle, a brass swan-neck handle. That's a very boho idea, Phil. -That's very boho, isn't it? -What would Hyacinth think to that? where we're going for the auction, isn't it? I think Hyacinth would think that was perfectly awful, scruffy. -She'd like a nice mahogany with a doily on top. After a mosey around, Jan finds something interesting. It's sweet, it's got a design on the bottom as well as the top. I would think there is every chance that that's a little snuffbox. Possibly Indian silver, but possibly not. You could sort of carry your pills around in your handbag in it. Whenever you needed them, sweetie. This is where I need a jolly good look. -Time to look professional, eh, Phil? As if you know what you're talking about. But the reality is, you and I both know that I haven't got a clue. I think it's £5 or £10 worth. And while she's there, Jan's spied another little something. This is quite sweet. What's that? Or you could put a fragrance in there? you can tell it's Chinese, cos these are bamboo shoots, look. and if you bought the two for £30 you'd probably be all right. You can make the one lot. Time to find owner Alistair to talk money, but hang on, what's this? Sitting down with tea and cake? Well, I suppose Phil is getting on a bit. -Oh, Alistair, you gave me a fright. that's where we're coming from. Hasn't it gone quiet? It has, hasn't it? Would you like a bit of cake, the cake's really good. the shirt off my back as well. We do have to watch him, Alistair. I think I could do them for a really good price of £40 for you, Phil. I think there's a nice profit in there. What about if we made you our best offer of 30 quid? then I might be able to accept it. Go 30 and see what he says. Hold your hand out like that, you've got to shake his hand. -Go on, then. You're a star, Alistair. -Thank you. Thank you so much. -Can I shake you by the hand? Nice bit of work there, Jan and Phil. The snuffbox and the spill vase for £30. Meanwhile, back in the Bentley. I have one word for you, Ronni. is that you just mispronouncing kites? -I'm going to fly kites, kites. Quite right. What on earth are they babbling on about? Ronni and James have motored to the town of Darlington in County Durham. dedicated to a sport that dates back thousands of years. to find out just why this ancient game has survived the sands of time. -Ladies first, there we are. -Oh, yes, it's a quoit. Well done, James, quoit right. particularly in the north-east of England. And by 1881, the first official rules were printed. it was one of the five games of the pentathlon. Later on it came to England, brought by the Romans when they invaded. they were throwing it at an object placed on the ground. mining and steel industries, quoits had a peak of popularity. which, of course, it is? some of the founding members. There were, in fact, 49 of them altogether. there was a banker, a tanner. And that was different, wasn't it? That was unusual, that they were professionals. we have more professional people. And was that exclusive to Darlington Quoit Club in a way? Pretty much so, yes. And it goes on today. Enough of the history, what about a go at the game itself? -It's gone around the hob. Cracking shot. Your turn now, James. -We'll pay for that later. -That's out of your lunch money, isn't it? I'm a bit scared, I'm a bit nervous. Oh good, I'm still nearer. Hopeless, the pair of you! little since its creation 2,500 years ago. Time for James to recreate the game of the ancient Greeks. Oh, crikey Moses, he is! Watch how this is done, OK? The ancient Greeks would have felt the clay between their toes. He is a sight for sore eyes, that man. Crikey. Now, where's Jan and Phil? -Oh, yeah, yeah, yeah. Tim. they're going to arrive at another shop. Come on Jan, show us what you're made of! "Jan, you'd better get a move on and stop dilly-dallying," actually. What about the Bentley? Dare I listen in? Now, I heard a rumour that you two have been doing impressions of us? Do you think it's impertinent? good job Mission Hall Antiques is big enough for this bunch. and Jan and Phil are first to arrive. I want to try and buy something nice and big. -Meaty beaty big and bouncy, that's what I want. All right, Jan. You've got £270 left. Doesn't take them long to find something either. Can you hold it? I'm going to get my glasses out. I think it's quite sweet actually, I think it's a good choice. -It's from Chester, it's gold. -That's where we're going, isn't it? Yeah, so we're going near Chester. So somebody might think that's rather lovely. -A bit of an association? -Yeah. RAF sweetheart brooch, 1926-27.
but it's all down to money, isn't it? Dave, what will be the very best on that? -What's it got on it? Are we going the very best straightaway, are we? you never know your luck really, do you? Well, that's one to consider then. Jan's spotted something too, a kitchen cabinet. and the light coming through the window. ..Ronni and James have arrived. -Well done, in we hop-ski. £180 is the sum total Ronni and James have left to splash. -Oh, yes, tell me about those. -They were based on Dutch flower bricks. -And it's tin oxide, pottery. And this is Isis, Oxford. -Cos that's the river Isis? -Would this be a copy of...? -Which would be, like, 18th century? -But it's a nice copy, isn't it? -That is a copy with great integrity. It's priced at £24 and is a possibility. On the other side of the shop, Jan and Phil are still looking. See, this one's rather sort of hunky chunky, isn't it? I've seen them used as shelves. And you don't like that one at any price? Er... Well, I don't mind it, how much are they? Shall I go and get Dave? which do you think you could do the best deal on for us? We quite like the big chunky ones. -I don't even know what's on it. The ticket price is £85. Our very best shot is 50 quid. I'll tell you what I'll do, you can have them for 60. I think that's very, very reasonable. -So, do you want to buy those? Stick with fashion, thank you very much. what about that kitchen cabinet? I think it's very sort of utilitarian and pleasant. And very popular at the moment. Yes, you want to tell me how fabulous all my choices are. Well, if you're selling in auction, I think it's important. -What could you do that for, please? -And is that the finish? Well, it's more or less, yes. I think if we bought that, that could lose us about 70 quid. there's not much point losing another tenner is there? there's a logic in that, isn't there? Yeah, there is a logic in that. While Jan has a think, what about the other two? they're, obviously, to print for a locomotive book, aren't they? So, this one is going through a bridge, which is a classic scene. We've got puff, puff, puff for smoke there, haven't we? You can smell the printing press on them. Ronni, you've got to choose one. -So, I like that one. -Shall we put that one down? And we've got the flower brick? -We've got the flower brick. -Are you happy with those? There was some reluctance there, Ronni. Well, you know, no, I am. I don't want to steam roller you into anything. You are being a bit of a bossy boots, James. Let's find Dave to cut a deal. The flower brick is priced at £24 and the printing block is ten. -Dave, can you do anything on these? -Can I do anything on this? otherwise we wouldn't have got the discount, would we? and I'll do that for 20. I think that's a good deal. Thank you, Dave. -Do you know, I've never seen a glass boot. -Talk about a glass slipper. Cinderella. That's kind of like for a hipster Cinderella. -It is heavy. I presume it's a vase, right? It would be a vase, but isn't that great? Isn't that the campest thing you have ever seen? Well, do you know what sells? Camp and cute. -Yeah, we've got the money. Come on, let's do it, let's go back in. -Can you do a special price? Special price, seeing as it's time to go home. Time to go home, that's always good. People are desperate to go home. -Let's do it. We've done it. -Have you got it? 25.
the very camp glass boot. Back to Jan and Phil. Remember the RAF sweetheart brooch from earlier? Well, Dave has agreed a price of £35, so what's next? that reminds me of the Vermeer painting. He said 150, he could perhaps knock a tenner off, perhaps a bit more. We've got 175 left, haven't we? -I'm going to make one last suggestion to you. there's a little child's Lloyd Loom rocking chair. Now if you want to spend all of your money. Phil's leaving Jan on her ownsome to close the deal. I would like to make an offer on the pine cabinet in there. -There's also this interesting little rocking chair here. Do you know how much that is? It would have 45 on it. And that's 35 and the cabinet is 140. I said 150 on the cabinet. £10, I wouldn't mess you about. Well done, Jan, you've blown the entire budget. What a way to finish the shopping. Come on, let's have a nosy at the bumper haul from both couples. Come on, actions speak louder than words. -Shall I show you our...? It's perfect for the office, when you're giving someone the sack. And then, look, here you are. And then, look at the soft close, look at that. -Look at that, come on! Which camp Cinderella left this here? -This is a glass slipper! -No, this is Cinderella's Wellington boot. -..she'd have this instead of a glass slipper. -Right, you've seen ours, let's see your haul. -..they've got some nice things. -I tell you, you could furnish a flat with that, couldn't you? -Now look, let's have a look at this. -cos it's got a little creature on it. -I have mouse cheese plate envy now. Does it open up to reveal decanters? -Yeah, it's just sort of... It's a hinge. It's very sort of earthy, like me. It's very Taurean. Earthy, passionate and prone to run to fat. Anyway, see you in Yorkshire. -I love a woodland creature. -I'm a slave to a woodland creature. -The boot's going to make a profit, isn't it? ghastly, kitsch boots, then, yes, it will. -Oh, rubbish. Come on, have faith. -What do you think about their stuff? if you know what I'm saying. I can own it. -I can't say any more. SHE GIGGLES TIM: You do own it, Jan.
And, on that note, let's get cracking to Stockport in Cheshire. We have an auction to attend! Oh, yes. James, I mean, he doesn't stop smiling. -Actually, it's a bit sinister. There's a touch about the "Here's looking at you!" -It's a touch of the old Jack Nicholson. "My cocktail cabinet is going to be better than any goddamn..."
-".. goddamn pine kitchen cabinet." Jack Nicholson? That's a bit of a compliment. -The gents await the ladies' arrival. -Vision of loveliness and beauty. -I've got the feeling we're going to win. Ronni and James have spent £274 on six lots. Jan went for it and blew the whole 400 on six lots. where, hopefully, the profits will fly for this giggly gang. The auction is also open to internet bidders. The man thumping the gavel is Max Blackmore. Has he any special faves from our roadtrippers? it's a nice example and I think we'll do OK with it. This is as nice a pair of vintage steps as I've seen. Always popular as decorator's items, furnishing items. -I think they'll do quite well. First up, it's Ronni's hipster Cinderella glass boot. -I'm sweating. I'm so nervous. -It'll come up on the thing. Jan, my heart is literally beating. -Come on, let's kick off at ten. £10 anyone? -Can I hold it up? Ten bid, 12, 15, 18.
if that's the case or not, but I'm desperate. -That's all right. That's all right. Bad luck. Fortunately, it's only the first lot. So that was a bit of a loss, wasn't it? It could have been worse. It could have sold for ten, couldn't it? Loving your spirit there, James! Jan's turn now, with the RAF sweetheart broach. I think this is going to do well. 20 bid, I've 20, 25? 25 bid. Lady in the front, you're against the net, 30 on the net. -What's 30 on the net? -Anybody else in the room? £30 on the net and I'm selling it. Didn't take off. Small loss, but plenty more to go. I'm not too upset about that. Good. It's Ronni next, with the printing block. Michael Portillo. Is he here? -He'd love it, wouldn't it? "of a steam train going to Hackney." -I've 10 here, up to 15. At £15 on the net. At 20. -Do you want one of your pills? Can I have one of my pills? It's on the front row, it's £20. All done and selling. Careful, we might buy it back ourselves. Better. This is more like it. OK. Who's got the James Braxton impression? I do enunciate my words. No, you do ENUNCIATE your words very well. EN-UN-CIATE! -Some people are too posh to enunciate at all! -Quite a lot of posh people do that. -There's no need to. Why would you? I think we might have touched a nerve with the Braxton there. It's Jan's turn, with the child's chair next. £20 with me, at £20. At £20 and 5. 30. £30, it's cheap, this. Come on. At £30, then. You've still got another four to go. Well, it could've been worse, could've been worse. Precisely! It's Ronni's watercolour set up next. 20 bid, 20 I have. Up to 30 now on the net, jumping in. Against you now on the net. We're in the room, £35. 35, the nice gentleman there. -Yes, no? Come on, £40 bid. Anybody else? All done this time? -Well done, James. That's good, isn't it? And I happened to choose it. -Yeah, Ronni, it's all down to you. -I think you're a natural at this. She certainly is. That is the biggest profit so far! It's very nice that you two could come along, isn't it? Do you know it's beginning to wear off on her now? I mean, I thought she was quite nice. Indeed she is, Phil. Right, it's Jan's kitchen cabinet next. because it reminded me of that Vermeer painting. sort of pure about it. 40 bid, at 40, 45. -It's going to happen to us, Ronni. -There you are, look, 55. -No interest on the net. He's just bought a very cheap table, hasn't he? Oh, dear, Jan! I'm afraid Phil was proved right with that lot. The auction room pitfalls, I'm afraid. Ronni, it's your flower brick next. that it's the copy of the Delft piece and just say it's the Delft. No, but it has 1996 on the base. Yes. We're on the net at 20. -On the net at 20. -At 22, I'll go in twos. -28. Going to you on the net. At 28 on the front row, then. Going to you on the net. God, I think I should take this up professionally. Yeah, great result there, Ronni. The Mouseman cheeseboard is next. That's my favourite of all yours. £50, nice and low. We're on the net at 50. -65 in the room and selling at 65. Anybody else now? It's gotta go. I know, Jan. The buyer has got a cracker of a deal there. Ronni's weighty Chinese bronze vase is next. Not so funny about my bargaining now. Sounds reasonable for the quality of vase. I'm selling that at £100. One and only bid on the net. Do you know, I've strangely changed my opinion about that vase. More like this, please, Ronni. Jan's hunky chunky ladders are next. Who wants a step up? You could put your plants on there. -Well done, you! Well done, you! -On commission with me, at 70. Any further bids now at 70? All done in the room? Gone away on the net, it's with me. Congratulations, Jan. A wonderful result. Moving on, it's Ronni's beloved swish drinks cabinet next. Sir, may I demonstrate its soft close? -I'd be delighted if you do. -Do a little flourish. Like that. It's six o'clock, let's pretend it's six o'clock. -Oh, come on, it's very rare! I mean, I'm not an expert myself, but it is very rare. -They're buying out of pity for you! -Yes, all the best with that, sir. Ouch! What a shame for such a great object. It's the final lot of the day - Jan's snuff box and spill vase. 30 I have on the net. At £30. 35. 40. -£80, front row. Are you bidding down there? £80 on the front row. Anybody else now? -That helps us a little bit, doesn't it? Yeah, well done. It's very good. Certainly does and it's been Jan's best profit. I think we've all done very well. We better go and do the sums now. Good idea. Let's figure out the calculations. So Jan and Phil began with £400. After all auction costs, they made a loss of £129.40. but a much smaller one, at £23.08. ..making them the winners of the day! Don't look so serious. It's exhausting and I've got some numbers. Well, you're about £100 ahead of us. -Well done, you. Well done, you. Oh, well, time to head for home! I told you to get some oil! -Haven't we been to some lovely parts of the world on our trip? -Bye-bye, girls! We're so sad to see you go! 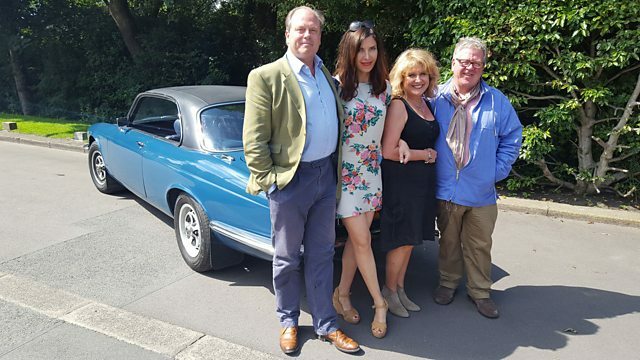 Two legends of British comedy, Ronni Ancona and Jan Ravens, are joined on this road trip by antiquers Phil Serrell and James Braxton. Starting in the North Yorkshire town of Redcar, they head for auction in Stockport in Cheshire. Jan gets rather carried away and spends every single penny of her entire budget, while Ronni gets a kick out of a very kitsch glass boot. A quick detour sees Jan find out why Hartlepudlians thought a monkey was a Frenchman and Ronni is left open-mouthed when Braxton takes off his clothes.